MANILA -- Public safety remains as the main consideration in the government's war on illegal drugs, Philippine National Police (PNP) Chief Director General Oscar Albayalde reiterated on Friday. “The PNP operates on the directives of our President Rodrigo Roa Duterte to wage war against illegal drugs within the bounds of the law. We can be tough on crimes while upholding human rights and the rule of law,” Albayalde said. Albayalde also said there are no extra-judicial killing (EJK) under the Duterte administration. “The word EJK was so abused. It was used and reused and abused, used irresponsibly for propaganda of some sectors," he said, noting that those killed during campaign against illegal drugs were common criminals. “These are police operations. Wala namang kinalaman si Presidente sa operations natin dahil ang utos lang niya ay (The President is not involved in our operations because his order is) to wage a war against illegal drugs,” he said. “It is unfortunate that some critics of this administration use the term irresponsibly for their own propaganda,” Albayalde added. He cited the latest Social Weather Stations (SWS) survey, showing more Filipinos are satisfied with the government's war against illegal drugs. “We are inspired and challenged by the latest Social Weather Station survey results which show that the Duterte administration’s campaign against illegal drugs has the support and approval of 78% of the Filipino people. We are one with the 96% of the Filipino people who recently said that they want drugs suspects to be arrested alive. We are equally tough against those among us who have gone overboard in the discharge of their official functions,” Albayalde said. Albayalde also said the successful campaign against illegal drugs is due to the decrease in violations committed by some police officers on the ground during operations. “In fact, we have penalized 555 PNP personnel from 2016 to July 2018, 362 of them were dismissed from the service for drug related offenses and 89 personnel for human rights violations,” the PNP Chief said. 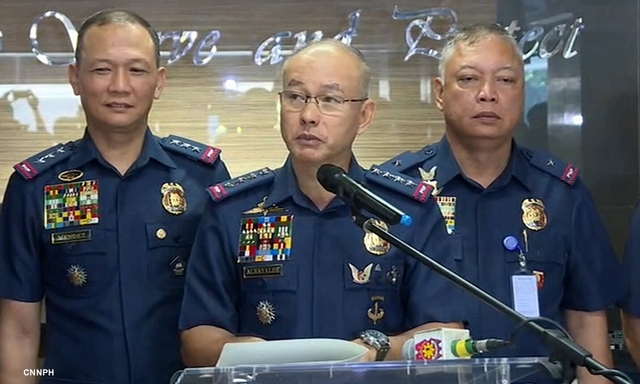 The PNP chief said this will serve as both an inspiration and a challenge for the police to intensify the campaign further along with the built-in safeguards to maintain its good intentions without irregularity or abuse.